Aldgate station opened on the 18th November 1876 after several years of very expensive construction. The stations history is rather plain unfortunately, with little happening within the tunnels and the last major extension was in 1882, which connected Aldgate to Tower Hill. The line ran right next a burial pit from the great plague of 1665. With over 1000 bodies being buried in St Botolphs graveyard, with some claims of the burial pit overlapping the line, and so the bodies had to be removed during construction. The station was also used as a site for shelter when air raid sirens gave warning of approaching German bombers during the second world war, but it never saw any deaths from this and the station was undamaged. Today it is open as a normally operating underground train station and is of course open to the public all year round. Id just like to note that there have been some ghost stories pop up in relation to the tragedy of the 7/7 bombings, but out of respect for the people who died and the disgust of the parasite that detonated the bomb, these will not be mentioned. 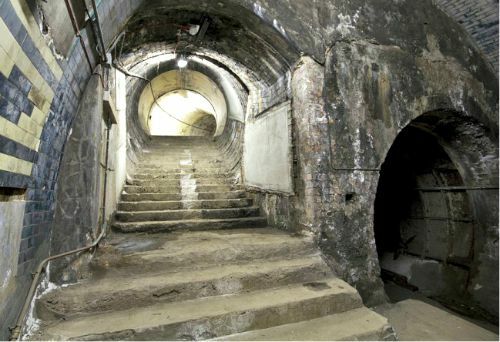 The station is thought to be one of the contenders for the position of most haunted station in the city, with the source of the hauntings thought to come mostly from the bodies of the plague victims that had to be removed. There are all kinds of stories about apparitions wearing old ragged cloths appearing on the lines or at the end of the platform when the station is quite, only to disappear when approached. But probably the most well known ghost is that of an old woman. She is said to have died saving the life of a track worker after he touched the electrified rail. She apparently went to shove him off the rail while he was being electrocuted, disconnecting him from the charge, but in the process she fell on it herself and did not survive the current. Apart from this there are a few smaller stories about various spirits, but one of the most interesting and bold claims comes from only a hand full of people who claim they have seen the legendary "Black Train". I have not been able to find the source of the story but there is a legend of a black train that is believed by some to carry souls to the underworld. It appears as an old fashioned black train, of late 19th century design pulling several carriages. There's a story that comes from one man who was waiting for his train late at night, and after a long wait he heard one coming along the tunnel. He went to the platforms edge only to see the Black train turn up. When the doors didn't open as normal he went to peer in through the windows but they were all covered with dirt, as if the train had been sitting somewhere for a very long time. After a minute the train started up again and drove down the tunnel into the darkness, where the sound of the engine suddenly stopped.